Seven Dollar Stories | With seven dollars in their pocket, women and men from Kerala, India, planted themselves in the U.S. with little knowledge of the culture. What happened next? A group of female entrepreneurs in Houston was asked to participate in a case study. The question posed: How did you find your voice and confidence? I was in the right place at the right time and got to be included. Here’s what I had to say about my own journey. In my teens, I had a voice and confidence, then the realities of the world tempered it. In my 20s, I had a voice and confidence, then the realities of the world tempered it. By realities of the world, I mean my realizations of how people different from me think, and my realizations of social expectations. In some worlds, I am invisible. In some worlds, I’m expected to submissive, and in others, aggressive. A lifelong Houstonian, I grew up raised by immigrant parents, absorbing their perceptions of the world and their language to describe the world. I also grew up learning the language of the dominant culture and how to survive in it. It’s been a journey of trying to be myself, trying to accommodate my immigrant culture and trying to accommodate the dominant culture. There are so many unspoken, taken for granted rules of engagement. What makes sense in one world often makes no sense in the other. When I turned 30, I read the autobiographies of Malcolm X and Frederick Douglass. They cut me deep. I thought about my daughter (I had only one kid then) and how she would perceive her place in the world. My whole life I’ve battled two personalities – one that is confident and driven, the other that has internalized inferiority and invisibility. How could I talk about my immigrant culture life, when I would only be met with blank stares from people who had no context for it? This topic is interesting for me because I’m in a season of transition and unrest, trying to find the language to express where I stand at age 32. I’ve learned how to be more self-aware, to pinpoint my moments of discomfort and why they’re there. To separate my worth from my perceptions of what people think or say. I’ve learned to have peace in certain moments that would have riled me in the past. I’ve lived in a world where there was no category for me. Where I’ve been on the outside looking in. Now I’m reconciling the unreconciled parts of my story. Who am I? What do I value most when values are in conflict? How do I share the rich, fascinating, untold parts of my story? I’m finding my voice and confidence as I intentionally take time to write and reflect. As I engage in deep one-on-one conversation with people. As I find opportunities to teach what I’ve learned. And even as I make an effort to eat right and exercise, so my mind can think more clearly and I can show up more enthusiastically. I’ve learned that the fuel I need to thrive is fourfold: deep conversations, observation and reflection, regular self-expression, and a sense of belonging. One day after my father’s funeral in India, my two uncles took us to go see his childhood home where my brother and I used to play. Now someone else owns it and rents it out. We hadn’t seen this place in a few years. Much was different. When I was five is when that stone wall was built. It had been just a little bit of wire fence (if you could call it that) and open fields before. And of course, the customary gate with the family name was added. The new owners never changed it. In the old days, there was a cow in that white barn with the clothes hanging from it now. I always dreamed of petting the cow or riding on it, but no one ever obliged, wisely. On the back side of the house were numerous cashew trees, with cashew nuts hanging from fruits. Sometimes we would collect the cashews and roast them. Too bad I didn’t appreciate the taste of cashews back then! Behind this grove of plants in the front yard was a rubber tree farm. Now it’s overgrown and weedy. And behind that was a fence of bamboo plants, which separated the yard from the clean green rice paddies. This little dip in the road, it used to be a huge gap that connected the rice paddies on either side. It was always full of water, like a big ditch but right in the middle of the road. Even when we drove over that road by car, it had to drive through the water to cross. One night, in the pitch black, my dad walked my brother and I across this dirt road to go somewhere. We waded through the water. He shined his flashlight. Just a few feet from us in that water, was a skinny snake lifting its head six inches above the water and peering at us. And we kept on sloshing through the water. This is the well we got all our water from. After my dad died, we stood here by the well with my two uncles. My dad’s older brother said, I remember when your dad fell in, and I had to get him out. Then my brother said, He told me you fell in, and he had to get you out. It’s amazing how stories shift depending on the storyteller. I think after my dad died is also when I first started to realize he was probably two years younger than I actually thought he was and than all his paperwork said he was. When I think of this house, I think of how big everything looked when I was 3, 5, and 9. I think of sleepovers with my cousins. My cousin Rolson once did pushups with his bare knuckles on the front steps. My grandma once held me, patted my back, and said, “Baboooh, Baboooh,” and that was the first time I remember hearing that word. We had a pet monkey in the yard, in a cage. Her name was Seethamma, after a mythological queen. She was not happy in the cage, as you might imagine. That’s when I learned that monkeys had their own language to cuss in. It always sounded like she was screaming curse words. We fed her fruits. One time she reached out through the cage and ripped a part of my brother’s shirt with her claws. I don’t think we had her for too long. There are many more memories, and I hope my mind can hold on to them. It was special to go back and see this house at age 26. There was a time when you had to go to the Indian grocery store to find Indian food. I snapped this photo in Fiesta in 2009. There was an aisle dedicated to “Indian/Pakistan.” Back then this was novel to me. Now it is a reality. Even in H-E-B you can find this stuff. It’s no longer so “ethnic” but becoming everyday American fare. He probably speaks for a lot of us. Check out Shehan Jeyarajah’s editorial, “If You Knew Me, You’d Know I’m Not the Typical South Asian” in the Baylor Lariat. During Welcome Week at Baylor, I remember walking across campus back toward my dorm with one of my friends who was Indian. I had been on campus for a grand total of three days, and to this point, it was everything I had hoped it to be and more. Some other Baylor students stopped us along the way to ask if they could pray with us. I figured this was just something people did here, and obliged. We don’t fit perfectly into the Malayalee stereotype or even the [insert denomination here] Malayalee expectations. My parents never pressured me to be in medicine or other “typical” fields. They actually encouraged me to pursue whatever my heart desired. We’re in a time when we each have permission and the luxury to be ourselves, to pave our own way. Other people paved the path for us, and we happen to be born in a time where opportunity of every kind abounds. I know very few people my age worried about sending money back home or financially supporting siblings or other family like the generation before us. I think I felt so different growing up, different from people at my American church, at my school, at my Indian church. But I didn’t have the language to describe what I felt or what I saw. I’m still trying to figure that out. But I’m thankful to live in a time where it’s more OK to be yourself, whatever combination of environments that is. Where there’s a little more equality and access and freedom than there once was. The American experiment can never be considered a success until we get away from thinking that we understand people based off a cursory glance at their skin color or do a quick Google search to claim we understand their core beliefs. We’ve got a long way to go; we’re each a walking combination of victim and perpetrator of the above. But I’m so thankful for where we are now. In 2005, eight of us drove to Mexico to help people in ciudad Victoria. I thought it was pretty neat to see a bunch young twenty something Malayalees talking and singing in Spanish. And while we were there, a sweet Mexican lady showed off her skills singing and playing “God is so good/nee mathram mathi” in Malayalam. Today, plenty of Malayalees speak Spanish without a hitch. Like my friend Millie who worked as a lawyer for human trafficking victims and immigration cases. I use it every day at my work, too. I’ve heard Malayalees sing Spanish praise and worship songs at church. It helps us connect and is a beautiful thing. Putzing around on a porch in India. 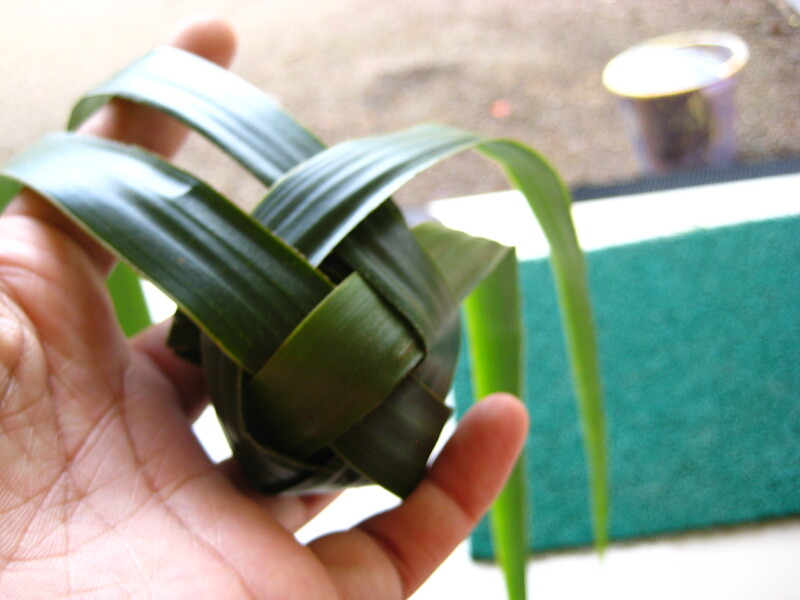 A favorite pastime: weaving coconut leaf balls. New mothers in Kerala get the royal treatment, I’ve heard. After delivering a baby, you lie on your back at your mother’s house and do nothing for a prolonged period: 28 to 90 days. Your husband keeps doing his thing at his house. Special medicines, massages and food are given to get the mother back to good health. That means your house becomes saturated with the smell of ayurvedic treatments. My mom says in the old days, mothers worked so nonstop hard, this was the only time they could rest. And it was essential, as their bodies needed recovery from labor and delivery. Other women kinfolk would come to the house to take care of things while the mother was in repose. All I know about post natal care in Kerala is what I’ve heard through the grapevine, so this is by no means an official description — just what people around me have said. Having just delivered a baby, I’m on a very modified version of these customs that have trickled down. I did not lay flat on my back for days on end, but I do get to rest. I really didn’t know how grueling recovery could be. Thank God for grandparents. The first two weeks, my mom helped feed and change the baby at night. This gave my husband a good night’s sleep, so he could go to work. The second two weeks, my husband’s parents helped the second half of the night and throughout the day. Baby and I stayed at my mom’s house during baby’s second week, which was a wonderful experience. After the trauma of delivery and recovery, the best healing process is to be nurtured by your mother. Both sets of parents arranged to procure ayurvedic herbal concoctions and massage oils from India. I’m on a twice daily regimen of spoonfuls of arishtam (herbal extract) and lehyam. My meals are mostly backyard vegetables (turned into thoran), fruit, rice and proteins. Nothing processed. I love eating appam, puttu and upma for breakfast. One ayurveda website recommends avoiding meat, beans and eggs. Funny, because I’ve been eating all three for the protein. We have a cousin whose baby was given a drop of honey on a gold ring to taste as soon as he was born. (They had to sneak this from the doctors!) Apparently it is thought to bring prosperity. We thought about doing this, just for fun, but ended up changing our minds.